There are many ways in which Haverford is an ideal place to pursue your musical interests in the context of a challenging liberal arts curriculum. The instrumental music program includes opportunities for music majors and non-majors to perform in Orchestra and Chamber Music ensembles. The Orchestra currently has over seventy members and performs a wide range of repertoire. The group performs twice a year and also performs with the Haverford-Bryn Mawr Chorale. Rehearsals are held on Thursday evenings from 7:00–9:30 p.m. in Roberts Hall, Marshall Auditorium. Students in Orchestra are guided in sectionals by top professional musicians, including some members of the Philadelphia Orchestra, throughout the academic year. Sectionals are also held on Thursday evenings. The Orchestra and Chorale have performed the Brahms Requiem, in joint performances with the University of Pennsylvania Orchestra and Chorus. Select players have the opportunity to perform in orchestras that include professional musicians and both students and graduates of Temple University and the Curtis Institute of Music. These orchestras have performed for the Haverford-Bryn Mawr Chorale, as well as for special programs such as a Native American Music symposium held at Haverford College. The Orchestra has performed 19th- and 20th-century works influenced by Native American music, including the premiere of Curt Cacioppo's powerful "Scenes from Indian Country." The program was broadcast on WRTI, Philadelphia's classical and jazz music radio station. The chamber music program is open to all instrumentalists who have auditioned for Orchestra. Pianists must pass a separate audition, held at the beginning of each semester. For all students there are various avenues for performances of chamber music and solo repertoire both on and off campus including on-campus "Coffee House" concerts held at Bryn Mawr College. Students have performed works such as Piano Quintets and Quartets by Schumann and Brahms, Piano Quartets by Mozart, String Quartets by Mendelssohn, Schubert, Beethoven and Mozart, Flute and Oboe Quartets by Mozart and Gordon Jacob, as well as Clarinet Trios by Brahms and Beethoven. Every year internationally renowned ensembles come to campus to perform and give master classes in chamber music. Past ensembles have included the Moscow, Ying, Colorado, Cavani, American and Mendelsohn String Quartets, the Dorian Woodwind Quintet, Music from Bard Festival, and the Boston and Empire Brass. Students are expected to attend a weekly, one-hour lesson with their chamber music coach, and participate in at least one student-led rehearsal per week. Everyone involved in chamber music, whether taking for credit or not, is responsible for attending all rehearsals and coachings. Exceptions are made in the case of illness or serious situations. Those who are taking chamber music for credit risk failing the class and everyone will risk expulsion from their group if these responsibilities are not met on a regular basis. Students are also required to attend all performances and master classes given by chamber music groups visiting Haverford and Bryn Mawr. The Sylvia Glickman Chamber Music Prize is awarded to the top graduating senior or seniors enrolled every semester (excluding semester/year abroad) in the Bi-College Chamber Music Program during their tenure at Haverford College. Preference will be shown for those students who have demonstrated leadership, commitment, innovation, and improvement during the course of their tenure in the program. Any instrumentalist applying to either Haverford or Bryn Mawr College should include a recording of their playing. The recording should be no longer than 15 minutes and include contrasting selections of music that best show the student's ability. 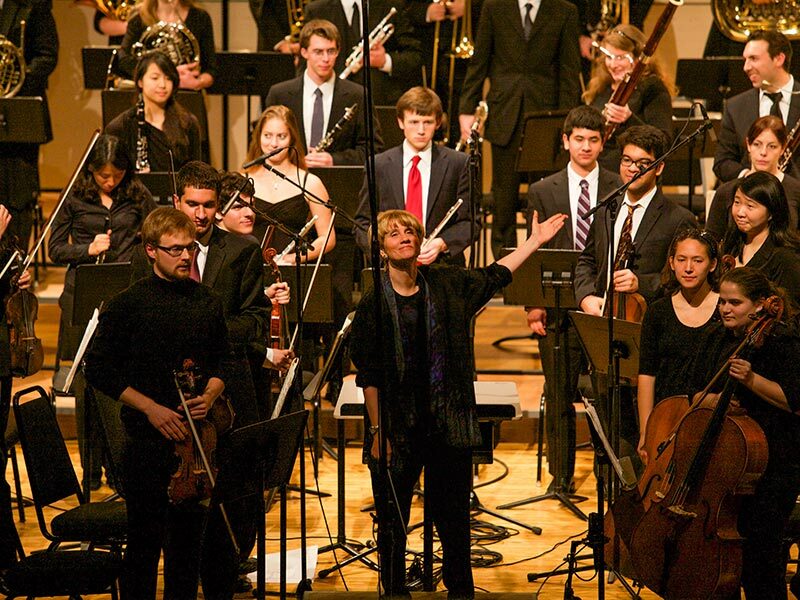 Auditions for the Haverford-Bryn Mawr Orchestra are held at the end of the first week of classes during fall semester. Audition materials are given out the week before and are usually excerpts from repertoire the orchestra will be performing. Students may also perform a work of their own choice.